Are you routinely experiencing stomach pain and indigestion? Acupuncture may be able to help. Stomach pain, often called gastritis, is a collection of symptoms that share a common symptom of inflammation of the stomach lining. Symptoms can include nausea, vomiting, loss of appetite, belching, bloating, a gnawing or burning pain or ache in the upper abdomen that may be either worse or better with eating, a feeling of fullness in the upper abdomen after eating, and weight loss. Gastritis is a loose term that can apply to a lot of different conditions related to the stomach. In the world of Traditional Chinese Medicine the approach we take is to look closely at the specific symptoms experienced, in order to determine the specific causes for each person, and the best approach for treatment. 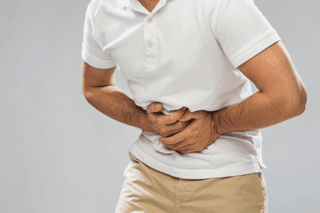 What causes a person to end up with gastritis? Gastritis is a result of the protective layer of a person’s stomach becoming weak or damaged. The stomach has a mucus-lined barrier that protects it from the acids that help digest food. Weakness in the barrier exposes the stomach lining to damage and inflammation from digestive juices. This problem can be the result of a number of issues — an auto-immune dysfunction, regular use of pain relief medications, from a bacterial infection, severe stress, alcohol intake, bile reflux disease (when bile flows up into the stomach), or it can be a result of different conditions or diseases that have occurred over time. Acute gastritis can be caused by the abdomen being exposed to cold temperatures or damp conditions, which can cause a blockage in the qi-energy of the stomach and intestines. Diet can be a major factor. Eating too little or too much food, eating too much cold food, hot-spicy food, sugar and sweets, greasy, fried, or dairy foods can damage the function of the stomach. Irregular eating habits such as eating too fast or on the go, eating late in the evening or at night, eating while stressed or emotionally upset, skipping breakfast, eating while performing other activities, or eating irregular amounts of food from day to day may also be factors. Emotional upset such as anger, frustration, resentment, worry and stress can lead to stomach problems, as can overwork and physical over-exertion. For others it may simply be that they have an underlying constitution that is causing a weakness in their stomach, making them prone to disorders such as gastritis. From a Traditional Chinese Medicine perspective, gastritis can be caused by a number of different factors. Acupuncture and Traditional Chinese Medicine can yield excellent results in the treatment of gastritis and promotes healing of the stomach lining. In addressing treatment you will be asked about what medications, substances or antibiotics you have been taking. Treatment will work to address the underlying problem. Acupuncture treatments also being relief from the many variety of the symptoms of gastritis including nausea, pain, and vomiting. Acupuncture treatments can help to reduce stress and improve overall digestive functioning. If you have been experiencing problems from any of the variety of stomach issues, consider making an appointment. Try giving Traditional Chinese Medicine a chance to work for you as an effective treatment option for resolving gastritis, strengthening a weak digestive system, and preventing future stomach disorders from occurring.